Feast of Varanasi is a film in which nothing is quite as it seems. This is a movie featuring ugly and brutal murders yet it is undeniably beautiful and sumptuous to look at - the darkness of evil finds a home amongst an explosion of colours. This is a tale of wicked acts yet, tragically, one rooted in profound love. The only thing straight-forward about the film is how unique it feels in the modern cinema landscape. 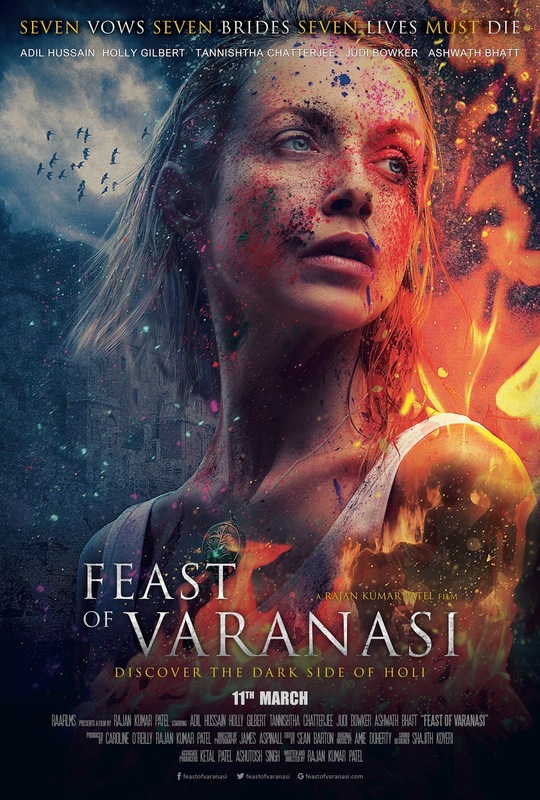 Directed by Rajan Kumar Patel (with whom I recently spoke to about creating his film), Feast of Varanasi represents something of an electric and eclectic variation on the twenty-first century serial killer format. We discover a number of women have been killed in the holy city of Varanasi and, as a perpetrator is sought, Patel's feature introduces us to a cast of characters who become entwined in the case. The sadistic acts of a brutal murderer contrast with the extravagant sights and sounds of a religious location preparing for the festival of "Holi", as we find ourselves in the midst of a dark tale wrapped deeply in Hindu lore. All the rules we come to expect from Western thrillers are subverted or dispensed with as Patel takes us deep into a heart of darkness as the killer prepares to make the greatest sacrifice of all. Aside from a smart, well-paced and taut script designed to keep audiences on the edge of their seats, Feast of Varanasi also represents something of a technical marvel. Filmed on 35ml stock, the location-shot movie is an aesthetic treasure which makes the most of the bright hues of a city celebrating colour and of fires symbolically burning throughout - themes of the duality of light and dark, life and death, the material and immaterial are captured poetically by cinematographer James Aspinall. Similarly, it would be remiss to not note the incredibly evocative, vibrant score which imbibes the film with a lush sonic layer of intensity; as strings swell and swoon, we find ourselves further aurally immersed in an ancient and mysterious city full of secrets we desire to solve. Feast of Varanasi is a film which feels unlike anything else you are likely to discover at the cinema this year and, for those interested in expanding their cultural palette, Patel's cerebral movie is essential viewing. You must be kidding me !!! For someone who grew up in India and has visited Benares (Varanasi) on numerous occasions, this film seemed to be made for the Westerners who have a pre conceived notion of what the place must be like. The plot had gaping holes in it and felt very amateurish. Your review of the film was way off. I bet you have never been to Benares !!! Do me a favour, find another job !!!! Hello and thanks for your comment unknown internet dweller. To address your concerns - firstly, I am not kidding. Secondly, I don't believe I ever claimed this to be a piece of neo-realistic film-making. It's rather fantastical in nature, grounded in various ancient myths, so to assume that the movie would be a perfect representation of a location suggests you may have approached the feature from entirely the wrong angle. Please don't be offended if I put it to you that much of Indian cinema is rooted in elements which aren't entirely "realistic". There's nothing wrong with that approach at all - indeed, even the movies of Satyajit Ray were accused of this at one time or another. Thirdly, I'm not sure you have seen many "amateur" films or I'm quite certain you'd be aware that this is technically rather good - I defy you to do some research, spend a day or two watching no-budget movies, and to repeat your claim. With regards to plot holes, I'd very much like to hear what you were referring to so as to engage with your argument closer. Finally, re: another job - my qualifications extend beyond simply growing up in a country one film was shot in. Feel free to disagree, as you have done, but I find it rather bizarre that you are asking for resignations based on differences of opinion. Thanks, anyway, for your post and I hope all is well in your life, job and cinema-going experiences (aside, clearly, from this one).